See what PlayGround-LA Alumni are up to as we prepare for the November 11 round of Monday Night PlayGround. Photo courtesy of Mitch Goldstrom. 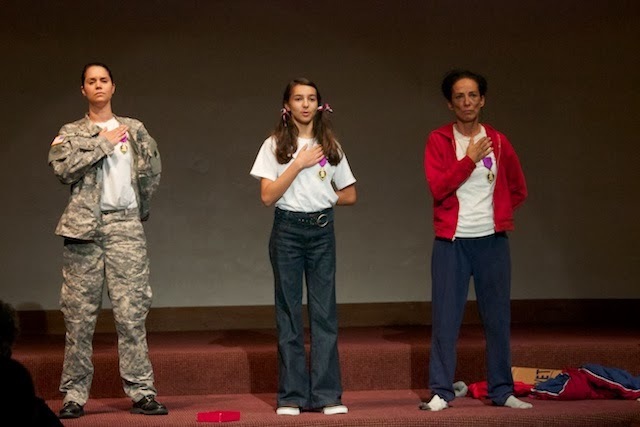 Ann-Giselle Spiegler’s short play, Indivisible, originally performed at the February 2013 Monday Night PlayGround, was featured in the “First Wave’ of Wave Fest in Santa Monica in September and October, playing to sold out houses. In December, Abigail Marks is appearing in A Noise Within's A CHRISTMAS CAROL. New company member of Classical Theatre Lab, Paris McCarthy is set to do a reading of A FAMILY AFFAIR (http://www.classicaltheatrelab.org/index.html). Joseph Patrick O'Malley just opened BY THE BOG OF CATS by Marina Carr at Theatre Banshee. Kathleen Cecchin is currently in post-production of her short film PAM. Laura Owen just got new headshots and can't wait to put 'em to good use. Andrew Crabtree's short film PLANNING AHEAD won the Critics' Choice Award at the No Budget Film Festival in September and PlayGround-LA actress Emma Fassler won the festival's Performance Award for her work in the film. Shanel Moore has been getting great workout/performances with Improv Trick LA at Improv Jam in Pasadena. Jean Altadel will be starring in The Musical of Musicals: The Musical at The Attic Theatre Nov 8-Dec 8. This winter, John Collins will play Thomas Baldwin in Frilly (a new play by Sigrid Gilmer), and Tesman in Hedda Gabler. Allie Costa's new play FAILURE TO COMMUNICATE recently premiered at the Sherry Theater in L.A. Marc Forget is shooting a trailer in November for the upcoming feature The Repass.